Saudi Arabia’s airstrikes against Houthi rebels in Yemen have raised fears of a proxy war and direct conflict between Tehran and rival Riyadh. But some analysts say this is unlikely — and caution there are other concerns much more pressing. The Houthis are members of a Shi’ite revival movement that has fought Yemen’s central government for at least a decade and took control of the capital, Sana'a, in September. Iran, which backs the rebels, has called the airstrikes a “dangerous action” against Yemen’s sovereignty. Iran is reported to have provided the Houthis money, weapons and training, but it isn’t clear how much and for how long. Nor is it clear how committed Iran is to the Houthis — and vice versa, analysts say. “They have this relationship of convenience,” said Adam Baron, visiting fellow at the European Council on Foreign Relations. Baron does not believe that Iran is in a position to increase its support to the Houthis. That said, Iran will likely feel pressured into some sort of reaction, says Alireza Nader, a senior international policy analyst at the RAND Corporation. 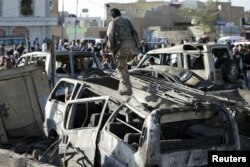 Analysts say that chances of all-out war between Riyadh and Iran are very slim. But that does not mean that the situation isn’t dangerous. Democracy Now reported Friday that 39 civilians had so far been killed. Six of them were children under the age of 10, according to Amnesty International . “This is a country that, when you take out the airstrikes, take out all the political conflicts, this is the most impoverished country in the Arabian peninsula,” Baron said. “This is a country that is grossly underdeveloped, that has been dealing with a weak government for some time. “When you add the fact that the country hasn’t had a functioning central government for two months and has a political transition that’s been heading nowhere for more than three years, when you throw in the fact that in addition to civil strife you also have foreign air forces going in and bombing the country, it’s very much something that is potentially throwing gasoline onto the flames of Yemen at this time,” he said. Many Yemenis already resent Saudi Arabia, Baron said, and some Yemenis who resent the Houthis resent Saudi Arabia. There is therefore a risk, he said, that the latter would side with the Houthis against Saudi Arabia, which has a history of meddling in Yemen. “There are a couple of other possible worst-case scenarios that could occur,” said Katherine Zimmerman, a research fellow at the American Enterprise Institute. One is that the Houthis could push into Saudi territory as has happened in the past, she said. “Of course, Saudi Arabia has positioned its military to prevent this, but there are some reports that some of the tunnels the Houthis dug in the early 2000s remain along the border,” she said. In addition, southern Saudi Arabia is home to a significant Yemeni population, which may not identify itself as being “Saudi first” and who feel politically marginalized. While she doubts there is a chance of any broad-based uprising, Zimmerman said the current military campaign in Yemen could stoke trouble for Saudis in those southern provinces. Zimmerman also believes that the current chaos in Yemen could empower al-Qaida in the Arabian Peninsula (AQAP), which makes its home in Yemen, and the Islamic State, which claims to have expanded its reach into Yemen. “I actually think that what it is doing is distracting from the fight against AQAP and ISIS, simply because the entire world is now focused on what the Saudi-led coalition is going against the Houthis in the west of Yemen and towards the north,” she said. But little attention is being paid to the east, AQAP’s historical safety zone, she said, particularly since the U.S. withdrew its personnel from Yemen a week ago.